Always On SSL is a cost-effective security measure for websites that helps protect the entire user experience from online threats. It delivers authentication of the identity of the website and encrypts all information shared between the website and a user (including any cookies exchanged), protecting the data from unauthorized viewing, tampering, or use. 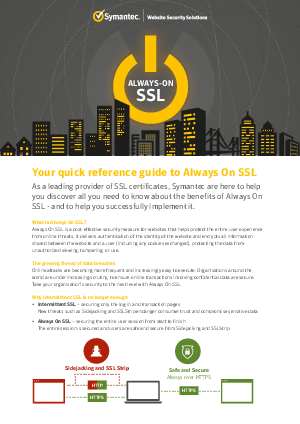 Take your organisation’s security to the next level with Always On SSL.